WE’VE PUT A GROWN-UP SPIN ON SUMMER CAMP! Join us for Camp BC, our totally awesome, grown-ups-only camp experience, offering a throwback to those summer camp days as a kid, but in gorgeous natural setting. This time around, we’re making camp even better with great workshops, booze, cool counselors, and an anything goes attitude – those lights-out curfews be damned! We’re dropping several epic Camp BC long weekend events this year at all three of our Basecamp properties. Join us in May for the unofficial kickoff to summer at Camp BC over Memorial Day Weekend! 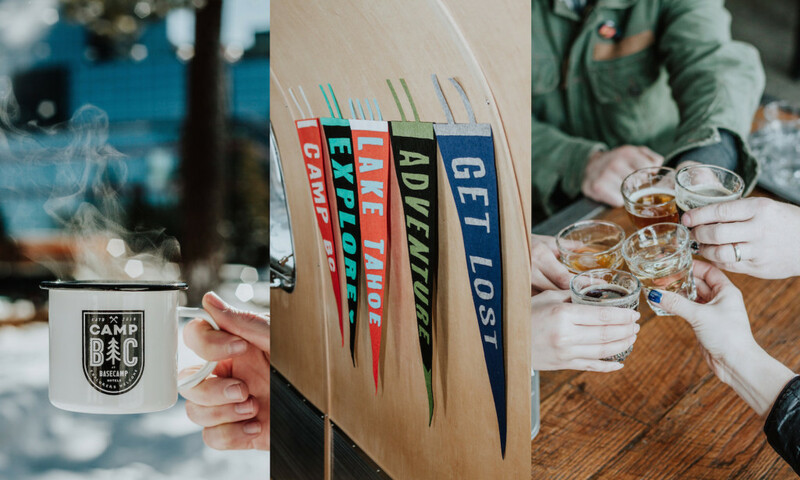 From coffee 101 and bike rides to yoga classes and communal dinners, build your perfect Camp BC week-end by clicking the link below. Bring a few friends along, or plan on making new ones while there. Whatever way you do it, this is sure to be one epic new experience destined for the memory books. But bunk (and other) beds at this camp are already filling-up. So reserve your spot now for one epic weekend of Camp BC fun! Mix and mingle with fellow campers! Campers can enjoy $4 draft beers and complementary popcorn at the Basecamp Lobby Bar. Plus, your first drink Friday night is on us! Get your blotters ready! On Friday night Basecamp Tahoe City will be hosting 4 rounds of Camp Bingo. The winner of each round will win a free drink – and the winner of our blackout bingo (4th round) will win some sweet swag! Get ready to get crafty in our Sun Room with some classic camp crafts! All materials and tools will be supplied, along with expert guidance through the hands-on process. Campers will be provided everything they need to make and leave with a completed project. Join local yoga instructor and mediation expert, Kate Dunn-Davenport, for a guided meditation in our Sun Room. In an attempt to take the intimidation of sitting in silence for 45 minutes away, this session will be very beginner friendly and actual mediation time will range from 20-30 minutes. Craft Beer Tasting with Outpost Brewing Co.
Meet the brewers from local brewery, Outpost Brewing Co., and sample their tasty beers! This 1 hour tasting will feature a sampling of Outpost Brewing Co.’s latest creations, led by their knowledgeable staff. Join local naturalist Tara Hostnik for stories almost as old as our prehistoric lake. From the tale of the Spirit Cave Man and the Donner Party murders to stories passed down by the local Washoe Tribe, there is so much history about America’s largest alpine lake to dive into! Grab a beer and meet us on the Lake View Deck for an evening of Tahoe tales. It’s not camp without s’mores! Join us around the fire pit Sunday evening to roast marshmallows and take in the night sky with local naturalist Tara Hostnik. Learn the basics of backyard astronomy and hear the natural and cultural history of the cosmos – well, everything we can fit into an hour, that is. Join experts from the League for a walk to the lake on Saturday afternoon where you’ll learn all about the Eyes on the Lake citizen science program and fun facts about the lake, local wildlife and ways you can help Keep Tahoe Blue. Community Yogi will be offering $10 morning flow yoga classes to all campers. Mats will be provided. Begin your day with Morning Flow Yoga on the lawn. Open for all levels as an opportunity to bring balance into your day. Centering practice, breath and alignment-aware asana. Warm up your body from the inside out to create a great start to your day! 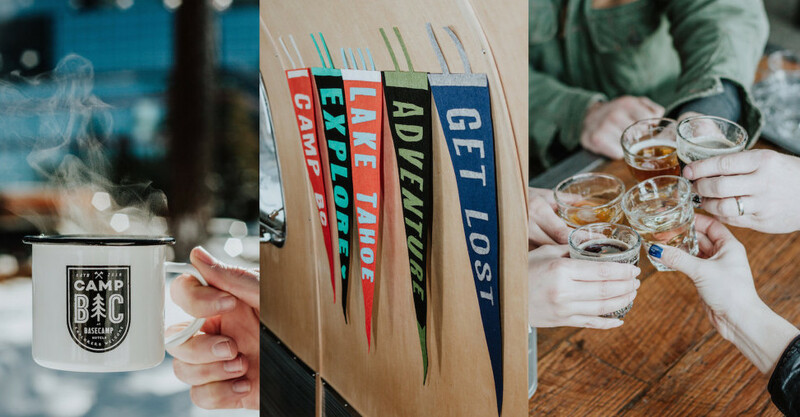 Jumpstart your Saturday at Camp BC with a three hour adventure that will walk you through the basics of brewing a great cup of coffee and get you outside in North Lake Tahoe. We’ll start with Coffee 101, during which the coffee experts at Drink Coffee Do Stuff will show you methods to brew an exceptional cup of coffee at home or on the trail – complete with donuts! All participating campers will also get their own 12oz bag of the DCDS Basecamp Blend to take home! Once you’re fueled up, we’ll head out for a bike ride. This easy-to-moderate guided ride will lead you along the picturesque Truckee River. Bring a water bottle and wear biking appropriate footwear; bike + helmet rental will be provided. Minimum of 5 people. Join writer and editor Lis Korb for a writing workshop about travel journaling—with a focus on how to document a trip while you’re on one. Lis is the Director of Content & Marketing for travel company AdventureSmith Explorations, and her job has taken her to write in and about exotic locales including Antarctica, Guatemala, Baja, Alaska and the Galapagos Islands. Learn her tricks of the trade, applicable to all platforms: from magazines and books to blogs and Instagram. Or perhaps to just help you pen that perfect postcard home to mom! Join Tahoe Sailing Charters in comfort and style to see for yourself, there is no better way to take in the natural beauty of Lake Tahoe than with the wind in your hair and a drink in your hand. All sunset cruises include light appetizers along with premium and local beer, Chardonnay, Pinot Grigio, Prosecco and a variety of non-alcoholic beverages. You can get pumped for camp and check-out all the fun by giving us a like and follow on Instagram @campbc_ and Facebook @CampBCbyBasecampHotels! *Must collect a total of 15 different merit badges to earn a two-night stay at any Basecamp Hotel. Black-out dates, terms, and restrictions apply.